What is Promoting Interoperability? This performance category promotes patient engagement and electronic exchange of information using certified electronic health record technology (CEHRT). This performance category is worth 25% of your MIPS Final Score for 2019. MIPS eligible clinicians report data on objectives and measures collected in their CEHRT. Beginning with the 2019 performance period, MIPS eligible clinicians must use EHR technology certified to the 2015 Edition certification criteria to report PI. If you select the last 90-days in 2019 as your performance period, the 2015 Edition CEHRT must be in place by October 3, 2019. Your EHR must be certified to the 2015 Edition by Dec 31, 2019. Log into your account and click on the Add/Edit link next to the PI category. Note: If you do not see this on your homepage, please begin by entering or loading your NPI/TIN combination or just TIN if reporting as a group. Enter your minimum 90 day reporting period (required). Complete the pre-attestation questions by choosing "yes" for each. 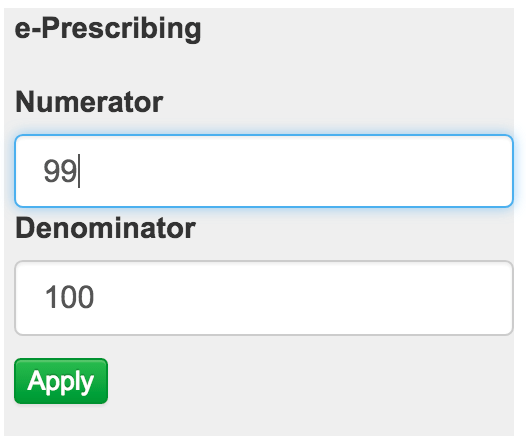 Enter the Numerator and Denominator, derived from reports run off of our EHR, for each measure into MDinteractive. e-Prescribing exclusion - 10 points are redistributed equally among the Health Information Exchange objective - each becomes 25 points. Support Electronic Referral Loops by Receiving and Incorporating Health Information exclusion - 20 points are redistributed to Support Electronic Referral Loops by Sending Health Information measure (becomes 40 points). A rule has not yet been established for how the Support Electronic Referral Loops by Sending Health Information measure's points would be redistributed if claimed as an exclusion. Public Health and Clinical Data Exchange exclusion - if 2 different measures are excluded, the 10 points are redistributed to Provider to Patient Exchange objective making this measure worth 50 points. The actions included in the Security and Risk Analysis measure are still required to be performed (attest yes) during the calendar year in which the performance period occurs, but it is an unscored measure.